Future Facilities is the first software company to implement the digital twin for data centers. The digital twin is a 3-D virtual replica of your data center that includes the entire facility’s infrastructure and IT equipment. It spans the full life of the data center, from design to operations, and enables you to predict the impact of any change made to your data center prior to implementation. The value of the digital twin lies in its ability to predict a future outcome based on present-day conditions. This predictive methodology is made possible by physics-based simulation. 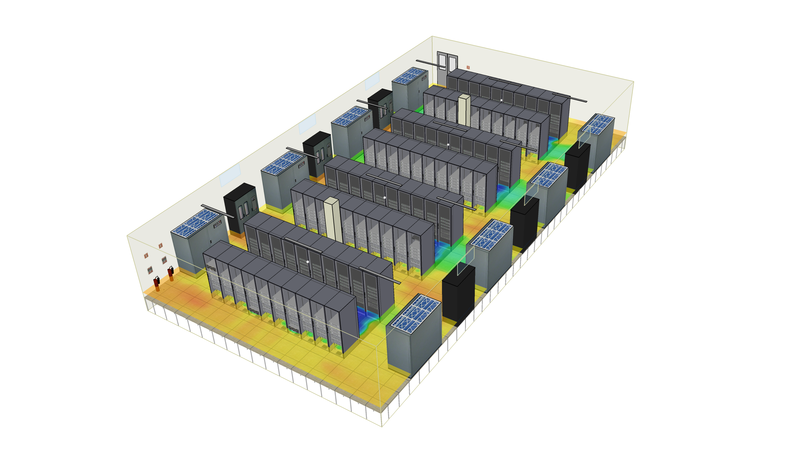 Without simulation, it is impossible to represent the true physics of airflow in the data center and accurately predict the outcome of change. Implementing the digital twin consists of our experts delivering a verified (calibrated) model of the data center. You can decide to maintain the digital twin or outsource this activity as a service. Our process consists of four phases. Input Physical Data: Via on-site visits and CAD drawings, our trained engineers create the digital twin. They take full inventory of the IT equipment inside the racks, map out the power network and measure the physical components of your data center exactly—from power to temperature. Build & Calibrate: Once we have the physical data in our software, we use the live data collected from the site as inputs for calculations. The software calculates the distribution of airflow and temperature in the digital twin. Please see the following White paper for more information on calibration. Results and Analysis: The results obtained from these calculations identify any issues present in the data center, such as hot-spots, poor airflow and cooling distribution, poorly loaded breakers, etc. There are four levels of service engagement, please see this document for more details. Staff Training: We provide all necessary training to operate and interpret the software for decision making. Integrate Existing Toolset: Simultaneously, we integrate any of the tools you currently use to assess the state of your data center (e.g. DCIM). Integrating to existing toolsets allows the data center digital twin to always be updated and reflect the current state of the actual data center. For more information on gathering live data and planned changes from DCIM and ITSM systems, please see the following 6SigmaGateway document. Explore Use Cases: We will assign one or several engineers to your project who will explore different ways in which to optimize power, space and cooling in your data center. In turn, they will report the changes that would need to be made to make these optimization steps possible. Capacity Planning: Along with exploring use cases, we also provide consulting services to help you with your capacity planning efforts. What-If Scenarios: This is one of the most—if not the most—important stage of our process. Here, we help you test “What-if” scenarios. What if my ACU fails? What if my power supply fails? What if my IT overheats in this section? Run “What-if” scenarios on any element of your design to test layouts and analyze the implications of different power, loading and cooling scenarios. Test Setup: Your team implements the software in a test environment to ensure all the internal requirements are met. During this phase, we run various tests to ensure the optimal operation of the software prior to production. This includes scoping out the right systems to host the software on. Production Rollout: Once the internal requirements are met, we will work closely with your IT admin for software install. This includes installing the software and security certificates, as well as establishing admin and user accounts. At Future Facilities, we believe that transparency in our process is key to ensuring successful customers. Contact us to learn how we can personalize our process for your business modeling capabilities and needs.